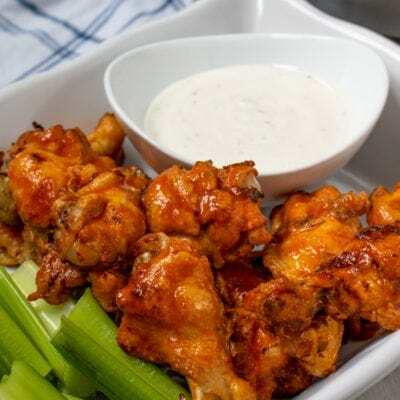 Instant Pot Chicken Wings: Ready in less than 30 minutes, these Buffalo Chicken Wings are the most tender and flavorful chicken wings you will ever have. Wings are my husband’s favorite go-to football snack and he has been known to devour more than his fair share during a football game or two. But convincing him that homemade buffalo wings are just as good as store bought wings, that is a bit harder sell. However, even he agrees, these Instant Pot Wings are Incredible. Not only are these chicken wings incredibly full of flavor, Instant Pot Wings are the most tender wings you will ever have! 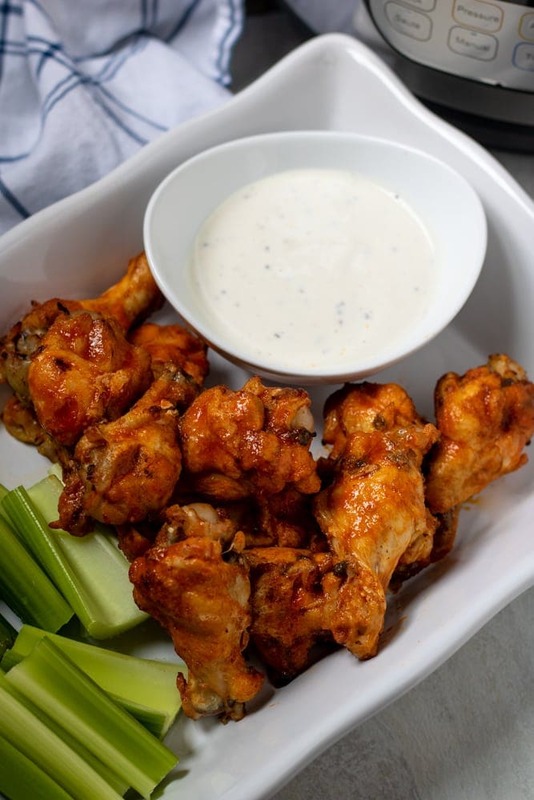 Tossed with a homemade spice rub and steamed to tender perfection, the chicken wings are then finished with a homemade buffalo sauce and broiled to achieve crisp skin. Season chicken wings with spice rub. Place 1 cup of water in Instant Pot. Place rack or steamer basket inside pressure cooker. Place wings on rack or in steamer basket. Close lid on pressure cooker and be sure to have it sealed. Toss with half the buffalo sauce. Broil chicken wings until skin is crispy. Brush remaining buffalo sauce over chicken wings. Serve with homemade ranch dressing or bleu cheese dressing. For Fresh Chicken Wings cook on high pressure for 9 minutes. For Frozen Chicken Wings cook on high pressure for 15 minutes. When cooking frozen food, it may take up to 20 minutes for pressure cooker to reach pressure. In my husband’s book, buffalo sauce is the only sauce acceptable for chicken wings. If Buffalo Sauce is not your favorite, feel free to use barbecue sauce or teriyaki sauce on these chicken wings. Mix together hot sauce (like Red Hot brand), with melted butter, honey, and garlic powder. The honey and butter help to add depth and balance the hot sauce and garlic makes everything better. If you need PALEO Buffalo Sauce, use Ghee. If you need Dairy-Free Buffalo Sauce, omit butter altogether or use a vegan butter substitute. I prefer to use chicken drumettes, as they typically yield more meat. It is not necessary to broil the chicken wings, but most people prefer the crispy chicken skin on the wings. Don’t be afraid to toss frozen meat with seasonings, the rub won’t stick as well, but it will still help to season the chicken wings perfectly. Use ghee in place of butter and maple syrup in place of honey for Paleo Buffalo Chicken Wings. Pressure Cooker Buffalo Chicken Wings are tender, full of flavor and much healthier than deep fried wings. Toss chicken wings with seasoned salt. Pour 1 cup water into inner pot of pressure cooker. Place rack or steamer basket inside instant pot. Place seasoned wings on rack or in steamer basket. Seal lid of pressure cooker, being sure vent knob is closed to sealed. For Fresh Wings: Cook on high pressure for 10 minutes. For Frozen Wings: Cook on high pressure for 15 minutes. Once the cook time has elapsed, do a quick release with a spoon or kitchen towel to protect yourself from burns. Remove chicken wings from instant pot and place in large bowl. Mix together the hot sauce, honey, butter, and garlic powder. Pour half the buffalo sauce over the chicken wings and gently toss. Place the chicken wings on a baking sheet lined with foil and topped with a cooking rack. Broil chicken wings under high heat for 2-3 minutes per side to crisp up the chicken skin. Brush the chicken wings with remaining buffalo sauce and serve. Thank you for the recipe. I’m wondering what the rub is made of? Hi Cheryl! This rub is my seasoned salt recipe, which is made up of paprika, garlic powder, onion powder, parsley, cayenne, salt and pepper. Could you explain more what is meant by “remove tips and separate drumettes and flats separated ?” Thanks for the great recipe! Thanks for your quick response as I was on a tight schedule- Super Bowl! These turned out delicious even though not crisp. Maybe my broiler differed from yours. Will try longer next time. Your website has been great as I figure out how to use my Instant Pot. Hi Ellen! I am glad you enjoyed the chicken wings, even though they were not as crisp as you would have liked. And I am happy your finding helpful info on my site. Reach out any time with questions. Oh that combination of flavors sounds amazing Shelia! Glad you enjoyed this recipe!